21-Mar-2008 -- On saturday 21th March, my daughter Balen, her hasdband Eduardo, his daughter Andrea and I, took the decision of do the visit at 41ºN 1ºW Conflence Point. We started at 10,00 am from Zaragoza to take the A-23 new highway. The road travel from Valencia to Pirineos mountains, crossing Aragon from Teruel to Huesca provinces. After 60 km we left the highway and took the A-2010 road to Lechon, Ferreruela, Bea, Fonfria and Rudilla villages. There we took a track and after a few minutes we where in a point near the confluence. There we stoped the car, becouse level had a signal to a nearest small mountain. I had seeng and reading the two previous visit in DCP web page, the situacion maps and aerial pictures. It seemed me quite easy, but really it was no very easy. It was very cold weather and a very cold wind day. So, wemen stayed in the car and men, Eduardo and I, climbed the mountain with the only idea of get the Confluence. It took us half an hour, more o less wihle phone, from the car, was doing a lot of calls to come back. After another half an hour crosing, coming back, climbing and feeling the strong and cold wind, we got only two pair af satellites in the GPS, but at last... all zeros. We did the victory sign in the car direction, 80 meters below, and then we stod on the site and we wehere toking pictures of cardinal points, GPS and ouerselves, and started the descend to the car. After a few minutes we took the road to Montalban, crossing a nice landscape of the zone. We saw and stoped to have a sigth of the “Castillo de Peñaflor” a rock-castel situed in a willage named Huesa del Comun (Teruel). We had a lounche in Utrillas, in the ”El Fogon” restaurant. Utrillas is a village wehere the famous cool mines are closed but another kind of metalic industries be installyn there. 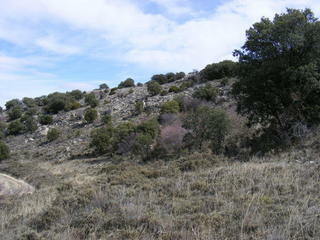 After lunch we took the N-2011 road to Caminrreal (Teruel) and then the new A-23 highway to Zaragoza. I would like be grateful to Ramon Barrachina and Jesus Marco, the first and second visitors, which chronicles helped me to met the Point easily reached. Last year I was in Barcelona and I meet Ramon Barrachina. It took a while have a beer talking about GPS, Points and Confluences and now we are very good friends.